Award-winning author, Russell Freedom, a master at writing nonfiction, again broadens our understanding of American history. America is a nation of immigrants. People still arrive daily from all over the world with one thing in common; they come for a chance at a better life: The American Dream. Both of my grandfathers were immigrants from Italy and Canada, respectively. The majority of immigrants from Eastern Europe, until 1954, were processed through Ellis Island in New York City. Those half a million people coming to our western shores, between 1910 to 1940, were mostly from China and other Asian countries. They were processed at the Angel Island Immigration Station located on Angel Island in San Francisco Bay. 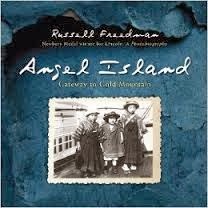 It was called, “the other Ellis Island”, or “the Ellis Island of the West.” Freedman offers readers an accessible, informative history of Angel Island and its role in the Chinese immigration story. It was the California Gold Rush of 1848 that brought young men from China to America. By 1853, some 25,000 Chinese immigrants had reached the gold fields. But these men, hoping for a better life, were met with hatred and violence. To prevent too many Chinese from sharing in the wealth, the United States enacted exclusion laws towards only the Chinese. While awaiting their fate at the Angel Island Immigration Station the Chinese expressed their fears and anguish in poems brushed or carved on the interior walls of the detention center buildings. These emotional poems, many translated and placed within the narrative, were forgotten until by chance a California park ranger, Alexander Weiss, decided to venture into a “two-story wooden structure” that was scheduled for demolition. Recognizing the historical importance, Weiss alerted the Asian American community who launched a campaign to save the building. For more than twenty days I fed on wind and tasted waves. With luck, I arrived safely in the United States. suffering in this wooden building? In Angel Island, Freedman conveys the misery along with the determination, while placing the Chinese immigration experience firmly in US history by referencing actual historic events from that era. Scattered throughout the book to complement the text are historic black & white photos, and endpapers showing an enlarged picture of how the Chinese characters looked carved on the walls of the station. Back matter includes source notes, bibliography, acknowledgements, picture credits, and index. Visit the California State Parks website to learn more about Angel Island. Here are a few nonfiction books about the California Gold Rush(there were quite a few). Gold! Gold from the American River! By Don Brown, The California Gold Rush by Dennis B. Fradin, How to Get Rich in the California Gold Rush: an adventurer’s guide to the fabulous riches discovered in 1848 by Tod Olson, and The California Gold Rush by Linda Jacobs Altman. 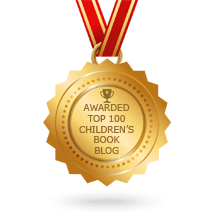 Fiction books about the Angel Island: The Dragon’s Child: a story of Angel Island by Laurence Yep and Landed by Milly Lee. Because this story for kiddos is told in poetry form, I am able to mention it in the online community called Poetry Friday. 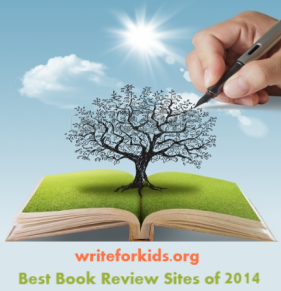 I am thrilled to find poetry for older students in the 7-12 age range. Grateful to RF & EC for this careful effort, which sounds a winner. Thank you for the tip off. Here on the U.S. east coast we are so familiar with Ellis Island. Angel Island should be part of our known heritage also. Thanks so much for this review. Russell Freedman does such a great job of presenting history to kids, and it sounds like he continues to do a great job with Angel Island.